This blog entry was supposed to be my promised Surface Book review. But fate intervened and I received a device that was highly unstable, suffering from frequent lockups and even a few BSODs. If you follow my Twitter feed, you’ll know that I tried everything I could think of to correct the freezes, but after three days of utter frustration, I decided to return the Surface Book to my local Microsoft Store. The new Microsoft Surface Pen and replacement nib kit retails in the US for $60. A standalone nib set is available for $10. 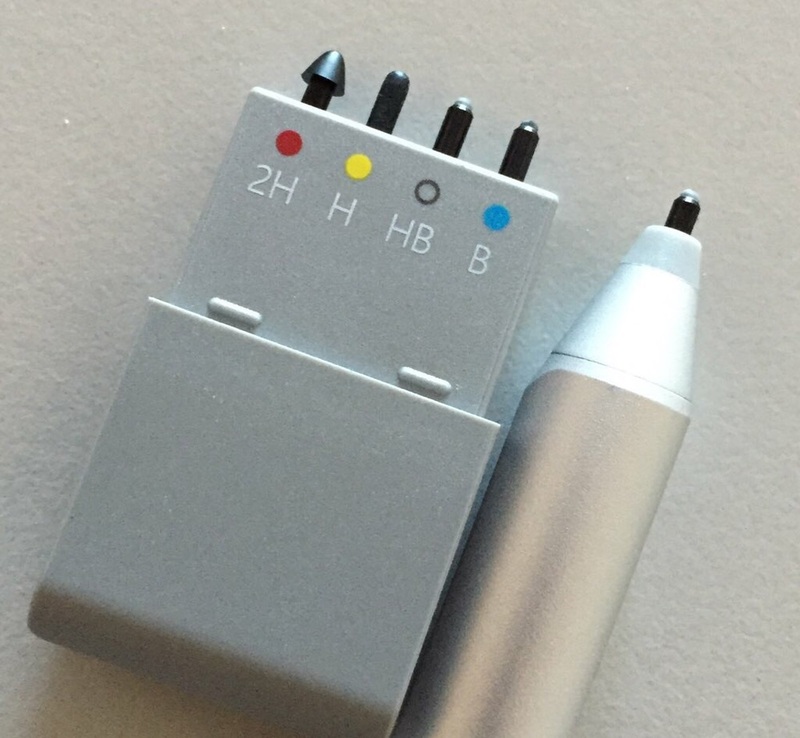 The pen is compatible with the Surface Pro 3 and other N-Trig DuoSense2 devices. The nibs will not fit in other pens. Ignoring telephone support may have been a mistake because several others who were having similar issues were able to get replacement units after troubleshooting via phone. By the time I decided to try to swap out my machine in person, I was told that the soonest I could expect a replacement was mid-December. I opted instead to ask for a refund and will sit on the sidelines to see how quickly Microsoft can address the lingering issues with their new flagship product. So despite my frustration with the Surface Book, I was despondent to let it go. To console myself, I decided to apply a small portion of my refund to a new Surface Pro Type Cover ($130) and Surface Pen ($60). The new Type Cover is outstanding: a huge step up from the last generation. I’ll have more to say about it during my Surface Pro 4 review. Although I still have the new Surface Pen that came with the Surface Pro 4, I was eager to try the new nib set bundled with the replacement pen. On the basis of my in-store testing, I’ve already advised several readers and Surface Pro 3 users to skip an upgrade to the new tablet and opt for a peripheral upgrade instead. Although the new pen won’t give SP3 owners any additional pressure sensitivity, I do believe the new nibs and eraser tip are worth the money if, like me, you like a little more “tooth” or friction from your pen nib. The replacement nib set (right) includes four nibs of varying hardness, from 2H (very hard) to B (very soft). The standard nib in the Surface Pen is HB. The H nib approximates the hardness of the Surface Pro 3 pen. The replacement pen included in the set is also equipped with its own HB nib. The nib set includes four nibs of varying hardness. The pen is supplied with its own HB nib. That standard nib is such an improvement over the slippery "plastic on glass" response of the Surface Pro 3 that I believe most users will be very happy with it. However, I found the B to be even better, approximating the toothiness of the Wacom Stylus Feel nibs I still recommend for the Surface Pro 1 and 2 and other Wacom EMR tablet PCs. The 2H and H nibs are so hard that I don't see ever using them myself. Perhaps artists doing very fine line drawing may appreciate the hardness. I tested the nibs on one device with a Photodon MXH film screen protector and found the H was acceptable on it, but I still preferred the HB. This is all a matter of personal preference of course. You may reach an entirely different conclusion. When the Surface Pen is used against a new Surface Pro 4 or Surface Book, it provides naturalistic feedback as pressure is applied. You can feel the sensation of the nib moving slightly into the pen body the harder you press. This isn't the case when you use the new pen on a Surface Pro 3 or other N-Trig DuoSense2 device. Although the nibs feel great, pressing harder doesn't provide feedback. I don't know how Microsoft achieves this trick with their new hardware, but it's very convincing. Most reviewers have already mentioned the Surface Pen's eraser tip, which really feels like a rubber eraser on both new and older devices. If you like to erase that way, you should really enjoy the sensation. The sculpted Surface Pro 3 pen nib (top) and the new Surface Pen nibs are not interchangeable. Since the only advantage of the new pen for Surface Pro 3 users is the new nib texture, you may wonder if you can just replace your current pen's nibs with the new generation replacements. Unfortunately, they're very differently sculpted (see above) and the new nib would have to be tapered in order to seat properly into the older pen's body. Swapping nibs is very straight forward. The nib case itself cleverly doubles as an extractor (see below). Make sure to apply a lot of pressure between your index finger and thumb or the nib will slip. I lost my grip as I was pulling out a nib and lost an HB nib against the gray-black patterned carpeting in my office and it hasn't turned up since. I hope that Microsoft eventually offers sets of same-hardness nibs. I would hate to pay $10 for a new replacement set when I'm only ever going to use one or two of the nibs. If any of you reading this prefer the hard nibs to the soft ones, message me and let's create a nib-swapping club! The bottom of the replacement nib holder doubles as a nib extractor. Apply heavy pressure with finger and thumb or the nibs will slip! The Surface Pen (middle) is compatible with N-Trig DuoSense2 pens like the Sony Active Pen (top) and the Surface Pro 3 pen (bottom). The new pen has a single side button that is hidden under the tip end of the raised rubber strip located along the pen's flat edge. The new Surface Pen is slightly longer than the Surface Pro 3 pen and it has a flat edge where the single side switch is located. That button is hidden at the tip end of the raised rubber accent strip. As much as I would have liked Microsoft to have kept a second programmable button, the flat edge and rubber strip really make it comfortable to grip the pen and move it with my index finger. Not trying to be cheeky, but the pen really does feel more like a pencil now. Unfortunately, the side switch is not programmable; it will only function as a right click. The eraser tip button has three functions: single-click launches OneNote, double-click triggers a screenshot (a fantastic new feature!) and clicking and holding calls up Cortana. If any of this functionality is important to you, you'll need to pair your pen via your Bluetooth settings. You won't need to pair the pen in order to just draw with it on your Surface Pro 3 or other N-Trig device. 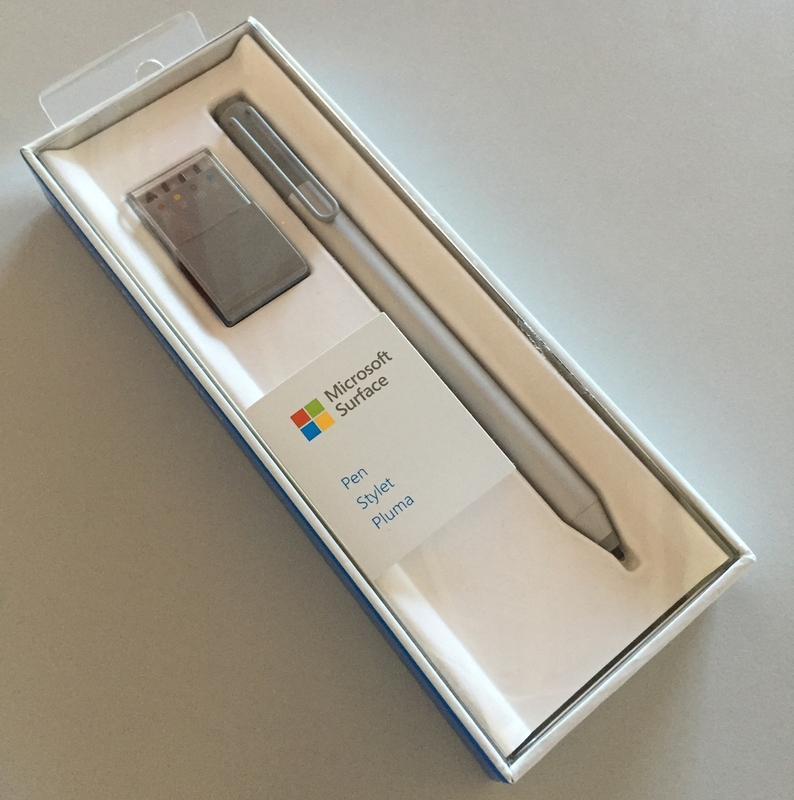 At the Surface Pen's unveiling, Microsoft indicated that the pen would hold a one year charge. Following that confusing statement, many users who've tested the new pen at a local Microsoft Store or Best Buy have come away convinced that the pen is disposable. That's absolutely not the case. The Surface Pen contains a AAAA battery that should last a year between replacements. Microsoft has inexplicably changed the the cap design so that the pen is nearly impossible to open unless you know the magic combination. And even doing so, I really worried I was going to break the pen trying to pry off the cap. As illustrated below, the cap requires an 1/8 of a counter-clockwise turn in order to align a notch in the cap with a contact in the barrel. And it still will require significant force to pull the cap off when it's properly aligned. Putting the cap back on requires carefully aligning the cap notch and contact. The bottom line is that this process is so finicky and precise, that I recommend you just bookmark this article now so that you can come back to it in a year's time when you need to replace your pen battery! 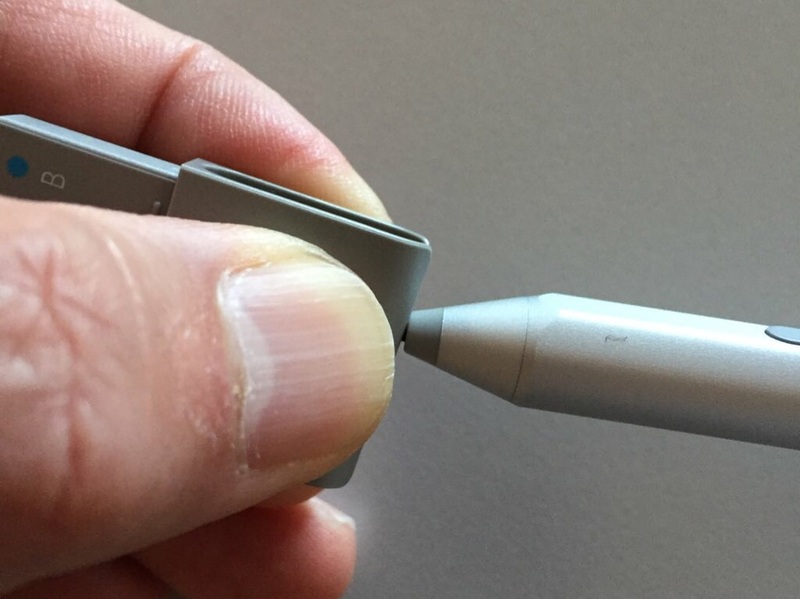 Opening the Surface Pen's battery compartment requires turning the cap about 1/8-counter-clockwise before pulling. The blurry barrel opening (bottom) contains a notch that must be aligned with the silver contact in the pen cap (right). In addition to testing the pen on the Surface Pro 3, I also tried it out on the VAIO Z Canvas and the Sony VAIO Flip 15A. In both cases, I vastly preferred the quieter soft nibs of the Surface Pen vs. the hard tapping of the VAIO and Sony pens. As I mentioned earlier, screen protectors will interact with your nib texture, so the softness you prefer on glass may be unacceptably draggy on screen protector film. I really didn't encounter any meaningful difference in drawing results using the new pen and nibs. On the Surface Pro 3, the added friction provided a bit more confidence in my strokes. Conversely, on the VAIO Z Canvas, the added drag introduced a bit more wobble in slow strokes that I ended up rectifying with brush stabilization. UPDATE: I was asked by a Twitter follower whether the new nibs are susceptible to the same wear as the SP3 nibs. I'm not sure whether later model Surface Pro 3 pens exhibited this issue, but in the early days, the nib would fray around the edges as an outer coating peeled off. The tip wouldn't continue to deteriorate at that rapid rate but that initial impression was very troubling. After about ten days of use, none of my new nibs show any signs of wear. Ultimately only you will be able to decide whether you like the new nib textures and whether the pen is worth the steep price. But think of it this way: the Surface Pen costs $40 less than an Apple Pencil and the eraser and flat edge are much closer to the feel of a pencil than any pen on the market! UPDATE 8/3/15: With the release of Windows 10, Microsoft has once again moved the location of the Wintab driver. It is now found within a collection of other Surface drivers and utilities here. You won't need to download the entire set. Just click download, then scroll down the list of available downloads and select Wintab-1.0.0.18-64-bit.zip . Reader Dawn Griffin recently bought herself a shiny new Surface Pro 3. But when she tried to download the N-Trig Wintab driver to enable pen pressure in her Adobe CS 5.5 software, she was greeted by a rude error message. Although the N-Trig site has been flaky before, this error appears to be different. Microsoft recently completed the purchase of the Israeli company's digital pen technology featured in the Surface Pro 3 and the Surface 3. The blog post announcement here is unclear whether N-Trig, Ltd. would continue as a separate company. Judging by the disappearance of its website, it appears that N-Trig is no longer a consumer-facing operation. When Griffin alerted me that the site and Wintab link were gone, I reached out to Surface Brand Marketer and Community Evangelist Markus Weickenmeier, who scrambled to find a new home for the Wintab download. According to Weickenmeier, the Wintab driver will be available in the Microsoft download center from now on. "The URL will change with each update, but searching for Wintab will always get you to the latest version." Look for further information soon on the Surface blog. As more and more software adopts Microsoft's RealTimeStylus model for pen pressure sensitivity, you may never need to install this legacy driver. But if you use older applications, it's comforting to know that Wintab support is still available. Microsoft working to correct N-Trig pen jitter? Microsoft observer and tech blogger Barb Bowman spotted a very interesting exchange in this morning's Surface Reddit AMA session. Reddit user JonBensonDesigns asked about the notorious pen jitter issue while drawing slow diagonal lines that plagues most penabled devices, but can be especially troublesome on N-Trig tablets like the Surface Pro 3. The response from the Surface team is by Steven Bathiche, a Distinguished Scientist in Microsoft Corp.'s Applied Sciences Group. So if we're to take Bathiche at his word, then Microsoft is working on a fix that may be applicable not only to future devices but also to current Surface Pro 3 and Surface 3 tablets. This is extremely encouraging news and I'll make sure to inform you here if and when that fix is issued! Microsoft asks: What would you do with a Surface pen? Long-time readers know my frustration with the depiction of the pen's role in Microsoft's advertising campaigns. If you were to believe every Surface Pro video you've seen until now, pens are only good for circling stuff, crossing items out and maybe highlighting text. No wonder most folks seem to think pens are pointless. Today, Microsoft released a video that takes a big step in the right direction: featuring three users who actually attest to and demonstrate the productivity gains of pen computing. Let's hope some of this makes it onto the next wave of broadcast ads. Perhaps to avoid confusion with the soon-to-be-released Surface Hub displays, Microsoft has renamed its Surface Pro 3 app and added some new pressure increments. You can now choose 12 steps of pressure for the SP3's N-Trig pen. To achieve the broadest range of strokes (the equivalent of Wacom's firm setting), select the leftmost position, shown above. The curve slope at this setting is not as gradual as you can set in Manga Studio. In fact, a linear curve is only three steps away. The majority of the new increments seem geared to note-takers who will want to minimize stroke variability and apply the least force while writing. Setting the pressure slider all the way to the right (see above, what Wacom calls soft) provides a very dark stroke with minimal effort. In addition to the pressure settings, the app allows users to choose between the Modern or desktop versions of OneNote for the Pen Top Button action. And the physical Windows button can be disabled if you find it gets in the way as you draw or ink. Unfortunately, the app does not address side switch addressability. For that you'll need to use a third party utility like Radial Menu. The updated Surface app is now available in the Windows Store.